More panels can be purchase to extend the run if required. Mesh roof to run is available. We use 40mm x 40mm redwood framing. 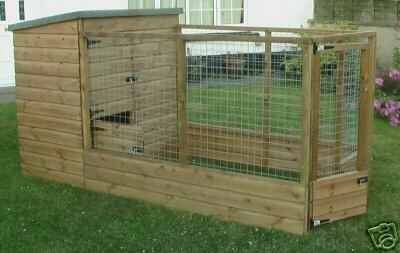 Kennel dimensions: Depth 2'6", width 4', height 4'6" with a stable door in front for easy cleaning and access. Run dimensions: Length 6', width 4', height 4', 2"x2" galvanized mesh all around. Large door at the side fitted with 2 bolts for extra security. Roof: 12mm Ply covered with Green mineral felt All fittings are black japanned.